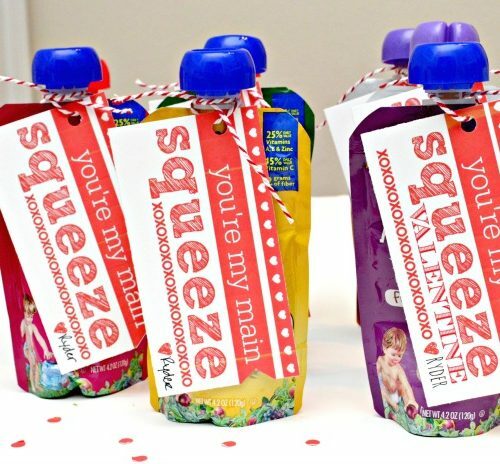 We are sharing special deals from Cricut in this post that contain affiliate links. This means we will receive a portion of any sale made from the links we are sharing. As always all opinions are our own. We hope you had a wonderful Thanksgiving with your family and friends. 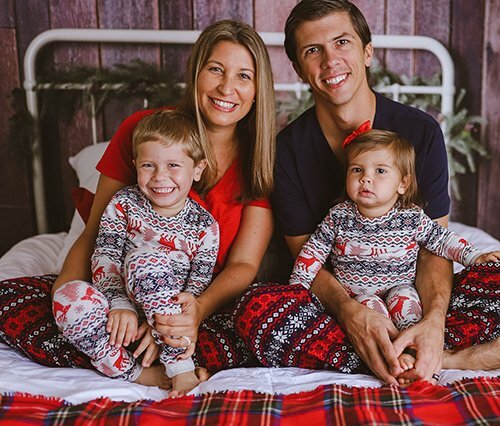 We unplugged for the day and enjoyed our first Thanksgiving as a family of 3! Ryder also enjoyed his first Thanksgiving dinner, loved it, and ate the most he has ever eaten in one day in his tiny little life! But enough about Ryder and our Thanksgiving. 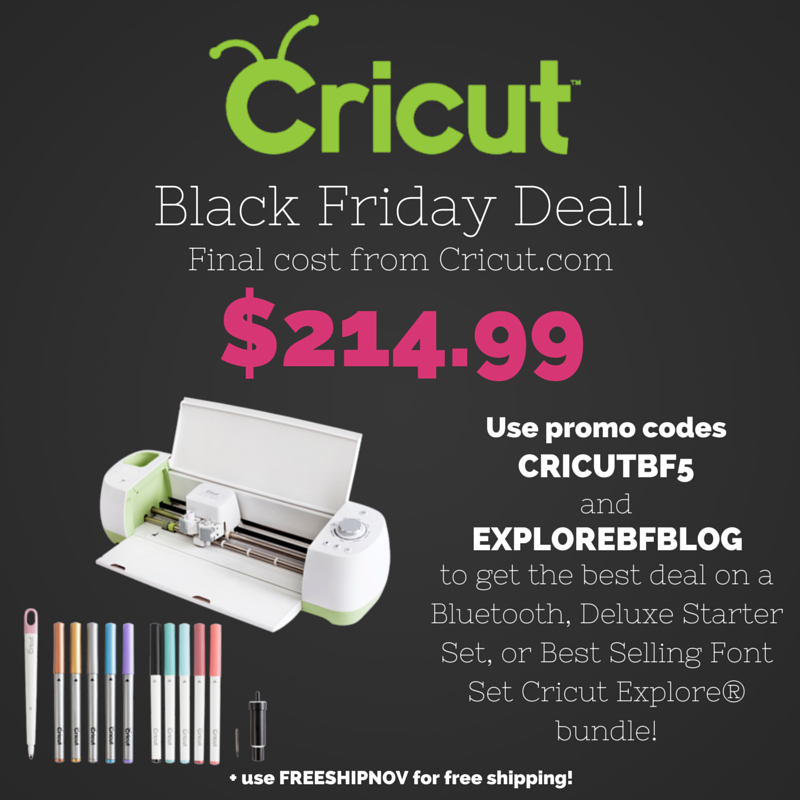 I wanted to share with our amazing readers some crazy good deals on all things Cricut! 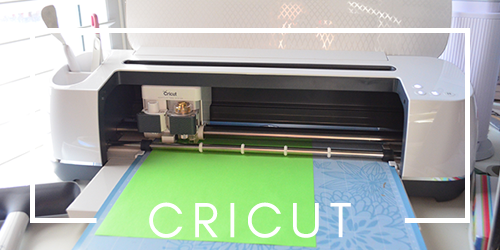 Earlier this week, I share a post about 10 Reasons Why I LOVE the Cricut Explore®. 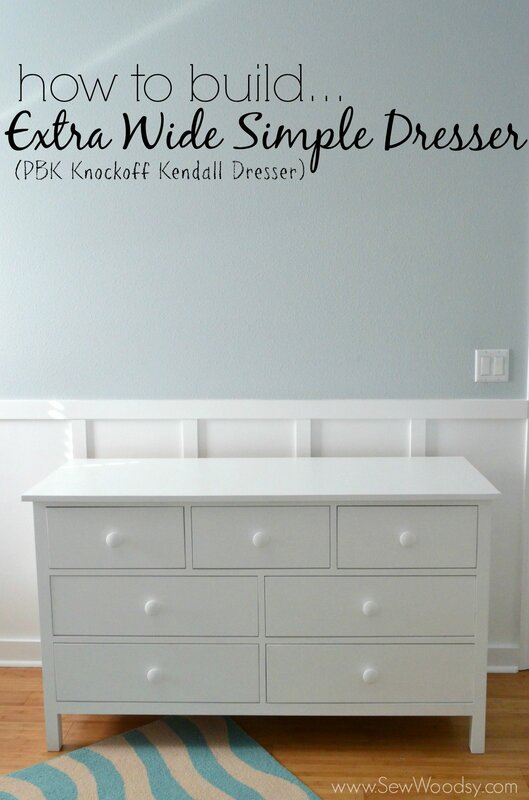 If your in the market for a new Cricut… a Cricut Explore to be exact I hope you read my post. 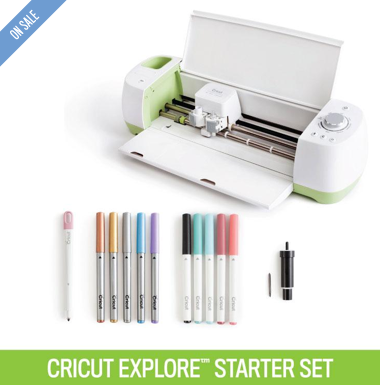 I have one of the best deals out on the market on Cricut Explores and accessories (make sure you scroll all the way down for special coupon codes). You won’t find these prices at Michael’s or even JoAnne’s (I promise–I’ve done my homework and checked). The prices and deals I’m sharing with you are good until December 1, 2014. So you don’t have to feel pressured to make a quick by. 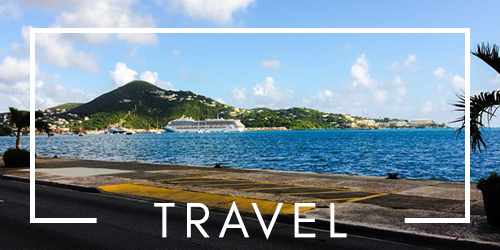 You can think about it for a day or two (depending on when your reading this). Just looking for the Cricut Explore®? You can buy it for $219 plus if you scroll down I have $15 worth of coupon codes off the machine PLUS free shipping! So that means you can get the machine for $205!!!! But let’s get real, you or the one you are buying this for are going to want some accessories to go with their machine… so keep reading and you’ll see all the great deals I have! 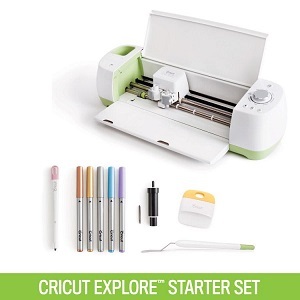 Cricut Explore® Starter Set: Let’s talk about the Starter Set! This is great for anyone who is getting started. Gives you a little bit of everything. 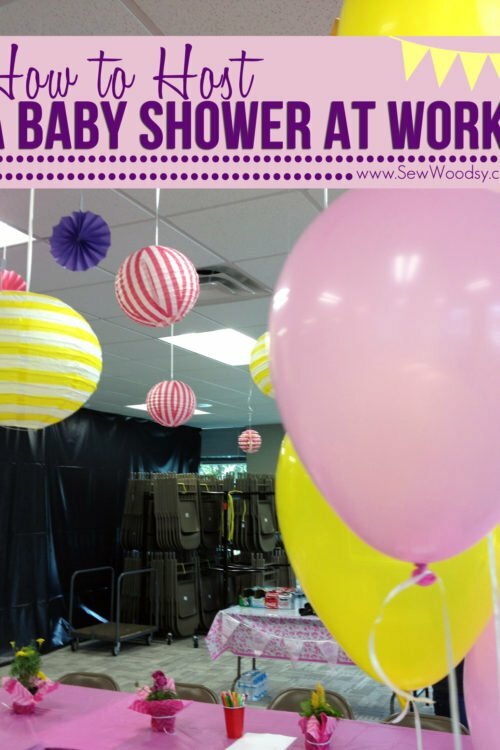 Do even more with your Cricut Explore® machine! Get a scoring stylus and Cricut® pens to score or write your projects while you cut them. Use the Spatula to precisely lift images and Scraper to scrape and clean unwanted scraps from any Cricut® cutting mat. Plus, get the deep cut blade to work with even the heaviest materials. Right now, this bundle is selling for $229 (not including the discount codes below)! 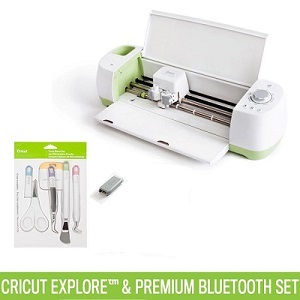 Cricut Explore® Machine + Premium Bluetooth Set: this is a great set for those who want to create wirelessly! Remember, I shared with you earlier in the week that in January, Cricut will be launching a new App… the Bluetooth Adapter will come in handy then! Right now, this bundle is selling for $239 (not including the discount codes below)! 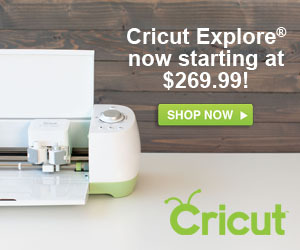 Cricut Explore® Machine + Deluxe Starter Set: Do even more with your Cricut Explore® machine! Get a scoring stylus and Cricut® pens to score or write your projects while you cut them. Plus, get the deep cut blade to work with even the heaviest materials. This set includes both the Metallic and Antiquity pen sets, the Scoring Stylus, and the Deep Cut Housing & Blade. Right now, this bundle is selling for $229 (not including the discount codes below)! 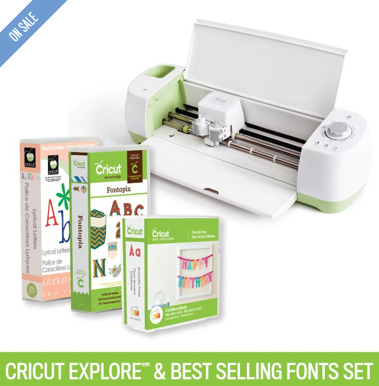 Cricut Explore® Machine + Best-Selling Fonts Set: Get the new Cricut Explore® machine plus Cricut’s top three font cartridges! 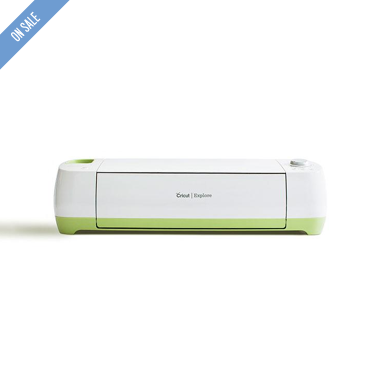 Remember you can still use cartridges on the Cricut Explore®! Right now, this bundle is selling for $239 (not including the discount codes below)! 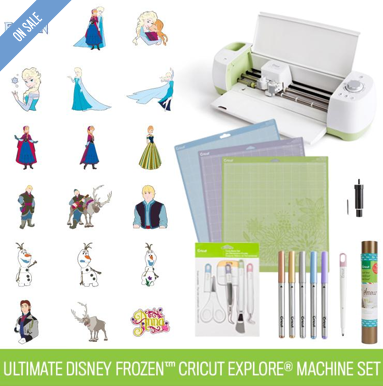 Ultimate Disney Frozen™ Cricut Explore® Machine Set: If you are a lover of Disney or of the movie Frozen, you’ll love this bundle!! Get the new Cricut Explore® machine plus the accessories, tools, mats, and material you need to create amazing DIY projects! This set includes the scoring stylus, deep cut housing & blade, metallic pens, tools, all three cutting mats, and vinyl! 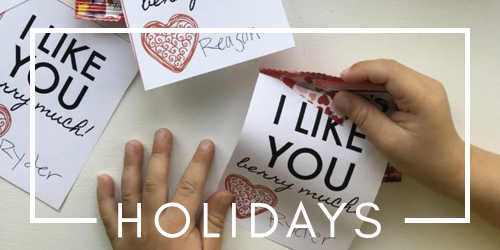 Use the scoring stylus and Cricut® metallic pens to score or write your projects while you cut them. Use the Spatula to precisely lift images and Scraper to scrape and clean unwanted scraps from any Cricut® cutting mat. Plus, get the deep cut blade to work with even the heaviest materials. And the Cutting Mat Variety 3-Pak gives you a set of all three different mats: LightGrip, StandardGrip, and StrongGrip. Right now, this bundle is selling for $259 (not including the discount codes below)! 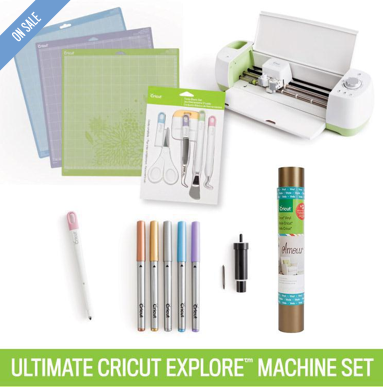 Ultimate Cricut Explore® Machine Set: I think this might be one of the best bundles. You get it all and on sale for $239! With this bundle you can really get started on whatever project you want right from the beginning! Get the new Cricut Explore® machine plus the accessories, tools, mats, and material you need to create amazing DIY projects! This set includes the scoring stylus, deep cut housing & blade, metallic pens, tools, all three cutting mats, and vinyl! Use the scoring stylus and Cricut® metallic pens to score or write your projects while you cut them. Use the Spatula to precisely lift images and Scraper to scrape and clean unwanted scraps from any Cricut® cutting mat. 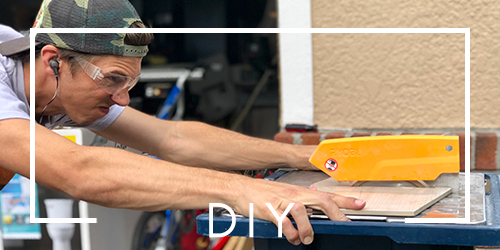 Plus, get the deep cut blade to work with even the heaviest materials. And the Cutting Mat Variety 3-Pak gives you a set of all three different mats: LightGrip, StandardGrip, and StrongGrip. 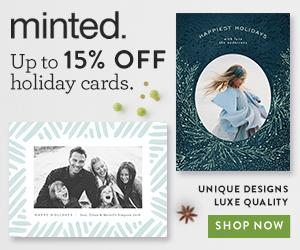 So there-ya-go… a few of my favorite Cricut Explore® deals this Black Friday 2014! Here are the THREE coupon codes I promised you. You can use ALL THREE on ANY purchase!!! FREESHIPNOV – Free Shipping On ANY Order! I told you I had great deals! Now, what are you waiting for? Get shopping!! !